It's Spring and for men it means changing up their wardrobe to all the warm weather clothing that has sat for months. Ask yourself "do you going to wear that again?". We all have our favorite summer items, the old tee shirts, the thread bare shorts and lightweight pants, but how do they look? Many men keep clothing well past their expiration date, either going out of style or becoming warn and faded. I keep a bunch of old favorites for around the house, but every Spring I buy just a few new items to dress up my summer wardrobe. Key to enhancing your Spring and Summer outfits is adding a few key items or one great new outfit that the each piece can be worn with things you already own. Adding a couple of new tee shirts or short sleeve shirts can do wonders for a mans wardrobe. For going out on those beautiful summer evenings a new pair of light weight jeans or pants will keep you comfortable and are more appropriate than shorts. In the warm weather the most noticeable item a man wears is his shirt and when it is hot a tee shirt is the go-to item. There are a few types of tee shirts, the new stylish well fitted tee shirt, the cool old logo or concert tee shirt and the worn, ripped or has holes, tee shirt that is really a dish rag. There are tee shirts that have emotional value, but no one who sees you in that tee shirt knows that value, they just see a beat up old tee shirt. For men over twenty years old, it is good idea to have some tee shirts that do not have a big logo, advertisement, lame attempt at humor or other words and pictures. A man in a kids tee shirt looks kinda sad, like the man is trying to hang on to his youth and ends up looking much older than he really is. At Justin Harvey we stock a few great designer tee shirts that come in unique colors and textures and for the man who really wants something unique we have hand painted tees for a stylish/casual look that will set any man apart from the crowd. For light weight pants and jeans, Justin Harvey has the most comfortable designer jeans and pants that are very light weight and come in a variety of colors and styles to fit any man. Our jeans and pants are tailored to fit men, not boys and are not skinny, slim, or whatever term for "tight" is currently in circulation. Also consider linen pants, there are lots of great mens linen pants from dressy to casual beach pants that will keep you looking cool and feeling cool. An often over looked item is your belt. There is a difference between a summer belt and and winter belt. Most winter belts are leather of some sort, black or brown, and summer belts tend be more colorful and woven or fabric. Having just a couple of colorful summer belts can enhance your entire summer wardrobe. There some out standing choices from Torino Belt Factory‎, from the very summer Torino Italian Woven Cotton Elastic Belt in bright colors for $68, all the way up to the luxury Torino American Alligator Belt for $475 in black, brown or cognac. 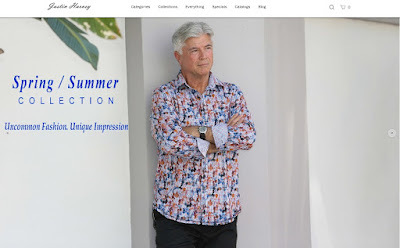 This summer can be your best looking summer to date with just a few fashion enhancements and a bit of editing out the clothing that has served it's time and should be retired. Think how good you could look in all those summer pictures cooking out, enjoying a sunset or vacationing at the coast. Good artcile, but it would be better if in future you can share more about this subject. Keep posting.